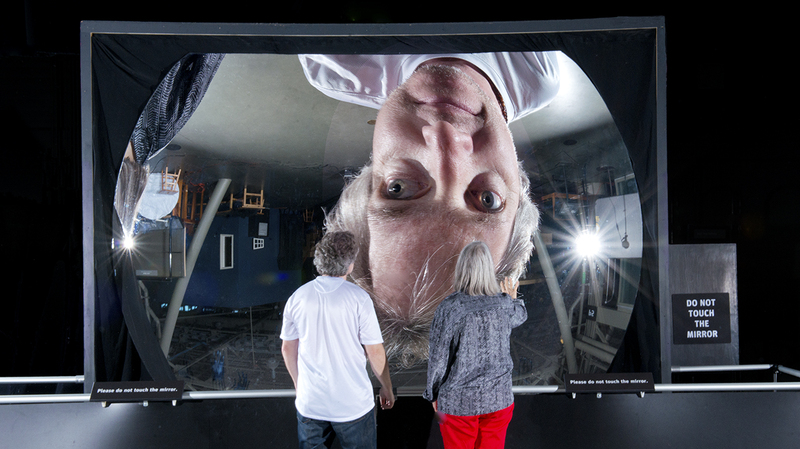 This jaw-dropping spherical mirror was donated to us by friends at NASA. Designed to be part of a flight simulator, a small flaw (you can look, but you won’t find it) made it unusable for its intended purpose. 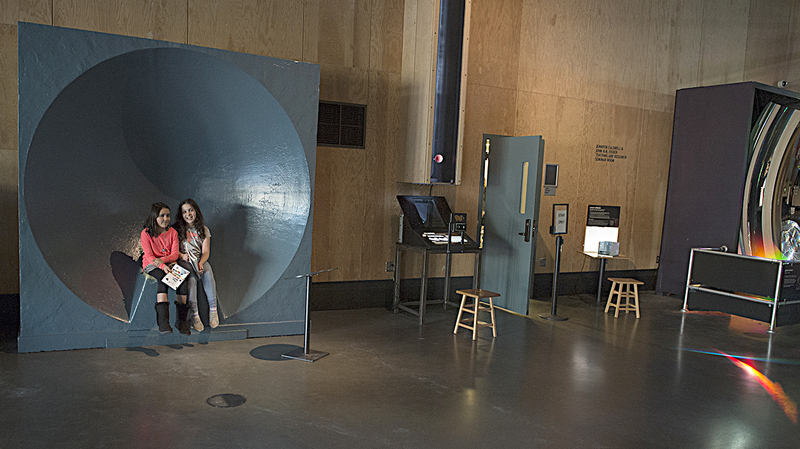 And boy, are we glad, because this is probably our single most popular exhibit. Is it narcissism—or love of optics? There are endless experiments to do here: Walk slowly toward it and you’ll see your head explode as you pass through the focal point, the point in space where the mirror focuses the incoming light. Shake hands with yourself, notice how surreally sharp distant objects appear in the mirror, and grab two friends and see if you can replicate the upside-down kiss made famous by Spiderman. Can you come up with any new tricks? Let us know. These parabolic sculptures transmit a conversation—or even a whisper—from one person to another across a great distance. The parabolic shape of this pair of sculptures amplifies sound by reflection: Incoming sounds reflect from the surface of each vessel and get focused to a single spot called the focal point. We’ve noticed that many people lean back and try to put their heads at the very back of the giant dish. Actually, the focal point is located directly above the seat—so you’ll hear more if you don’t lean back, but instead just sit up normally. If this exhibit seems familiar, it may be because you already met its twin, Archimedes, located outside near the main entrance on the Embarcadero. 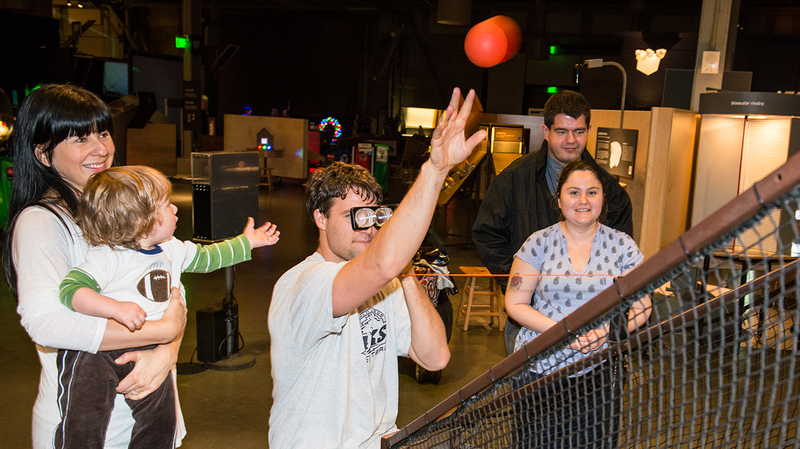 First, train your brain to make baskets wearing special goggles. Then take off the goggles and see how many baskets you can make—or not. Have you ever had a coach tell you “practice makes perfect?” Here you can see why some coaches prefer to say “only perfect practice makes perfect.” It’s just as easy to teach yourself a bad habit as a good one. Your brain and perceptual systems are dynamic and continually respond to your experiences. In time, the complex motions required to say, pitch a ball or swing a bat become automatic. Want to watch yourself fail in a different way? Flip the goggles upside down and try again. 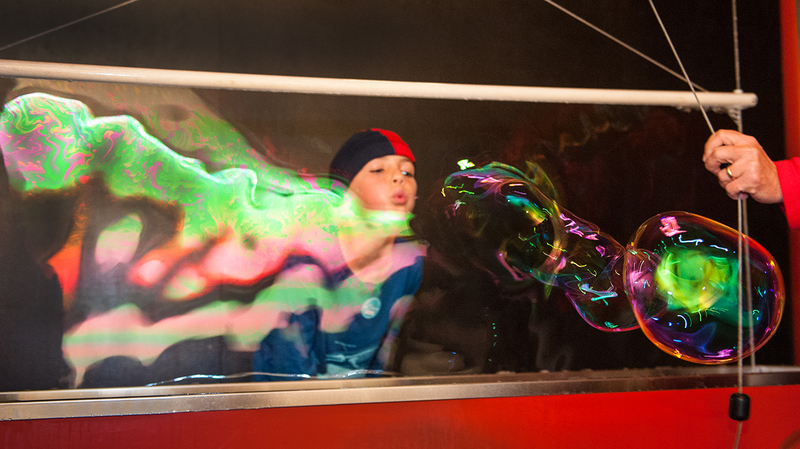 Soap film hits the big time as you slowly pull the cord and make a square soap bubble the size of a picture window. The cascading colors you see here arise from overlapping light waves that reflect from the front and back surfaces of the soap film—a phenomenon called interference. If you wet your hand with soapy water, you may be able to slowly poke it through the bubble. Also try blowing gently on the film and watch it bulge and ripple. Tech tip: If you happen to have a camera with slo-mo video, try filming the bubble as it pops—you won’t be disappointed. 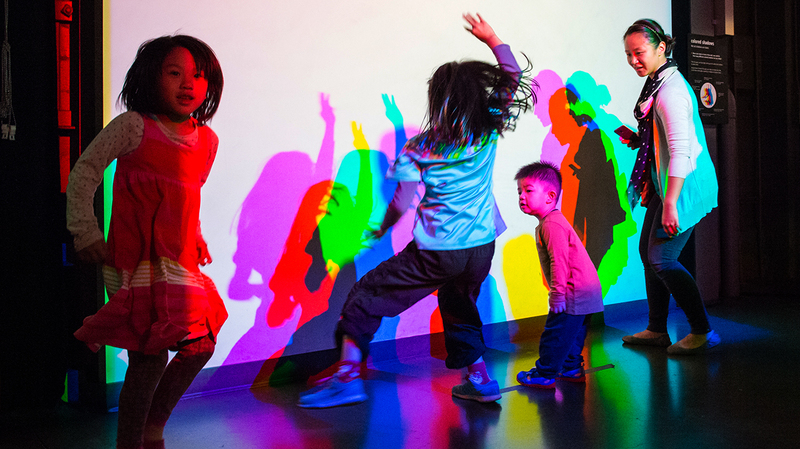 No single exhibit has inspired more crazy dance moves than this light-mixing classic. Step in front of this wall, and you’ll make shadows of various colors—yellow, magenta, cyan, red, green, blue, and yes, even black—that wiggle, jump, and strut their stuff along with you. Look behind you and you’ll see that there are just three different colored lights shining on the screen: red, green, and blue. These three are called the additive primaries of light, because together they add up to make white. Can you figure out what combination of lights is creating the yellow shadow?